Maso Canali is dedicated to making one wine--a singular, luxurious Pinot Grigio--from the finest grapes grown on the Maso Canali estate in Trentino, the birthplace of Italian Pinot Grigio. Set against the dramatic backdrop of the soaring Dolomites and glimmering Lake Garda, the terroir at these coveted high-altitude vineyards creates a wine with elegant floral notes and bright acidity, while the time-honored practice of drying a portion of the grapes contributes a rich mouthfeel and refined character. 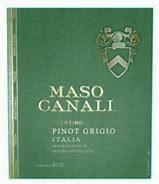 Home to wine grapes for more than 500 years, the Maso Canali Estate has cultivated Pinot Grigio since 1893.